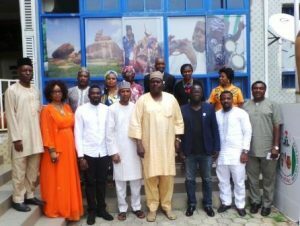 DG, NCAC MANAGEMENT IN A GROUP PHOTOGRAPH WITH DJAN EXECUTIVES AT THE CULTURE HEADSQUATERS. The umbrella body of Deejays Association of Nigeria (DJAN) led by its National President, Mr. Tade Adeyemi aka DJ Kool paid a courtesy visit on Otunba Olusegun Runsewe, Director General, National Council for Arts and Culture office in abuja, recently. Mr. Tade (DJ Kool) said the courtesy visit was necessary at this point in time because the association realised a man of passion with impeccable records has come to head a sector they strongly believed they can work with, therefore,”we have come to partner with the Council in order to benefit from your wealth of experience”. Otunba Olusegun Runsewe, in his opening remarks, welcomed the association and promised to support the body in any capacity possible, he further adviced the body to be guided against unprofessional conduct in any of your show”. TIME TO RECONNECT TO OUR CULTURE – DG NCAC.